Today, Jodi and I ventured over the Golden Gate Bridge and through the streets of San Francisco to the new UCSF Benioff Children’s Hospital. Our first visit to the hospital’s new location would bring us hugs and conversation with some of our favorite of Caemon’s caregivers, reconnection with our UCSF family. However, this was not our sole purpose for visiting. Today marked the delivery of our annual C is for Crocodile book drive donations. 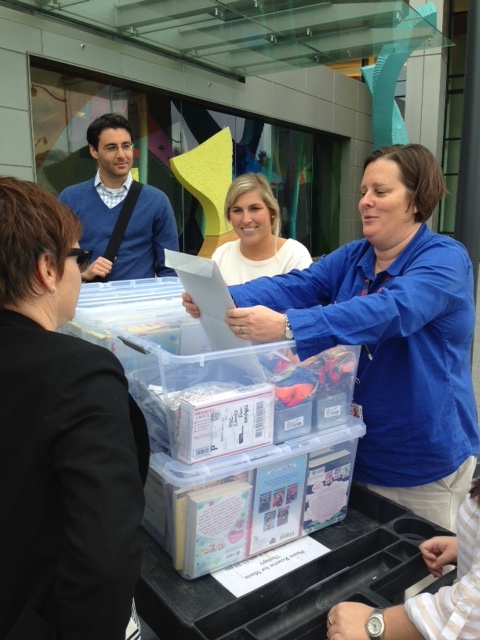 In five large tubs, we packed over 350 books for children from babies on up to young adults. These books, sent to us by our generous community, will be distributed today to children on the pediatric oncology floor at the hospital. The idea for this book drive was born in the early days after Caemon’s death. We wanted a means of honoring our son while giving back to kids like him. While we had seen many, many gifts of toys and hats and bears and more during his stay in the hospital, we didn’t see many new books, and Caemon loved books. With two English teachers for mothers, I suppose that is no surprise, but he was enamored of his stories. He would often make stacks of books for us to read, and we would sit on the floor of his room reading together until we made it to the bottom. Our moments reading to Caemon were some of our most precious, and reading to him in the hospital brought us a little taste of home and familiarity. For these reasons and more, we decided to hold an annual book drive in Caemon’s honor, and I can say it is my favorite thing we have done in his name. Not only are we able to celebrate one of our son’s greatest loves (and ours too), but we can use this as a regular connection and expression of gratitude to our UCSF family. Beyond this, the book drive gives our community a way to connect, to give in a very real way to patients just like Caemon. This past year, my dedication to this effort was renewed when I received an email from the mother of a patient at UCSF. This little girl had received one of our book donations, and it had helped her through a difficult time in the hospital. 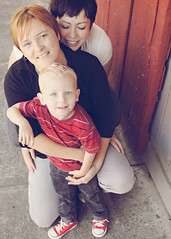 It was easy to see myself in this mother, to see my son in her beautiful bald daughter bravely battling leukemia. The message brought me to tears, for this one little book had done just what we had hoped: it brightened the day of a family going through the scariest time imaginable; it provided them a little respite from their lives on the front lines, a reminder of the basic routines of families of small children. Since that first message, we have kept in contact with this mom, following her daughter’s progress, cheering them on as this beautiful girl progresses through her treatment. And this year, as our book drive got underway, we received a big package from this family: they made their own donation of some favorite books of theirs, bringing the giving full circle. Today, as we dropped off our big bins of books, it was hard not to imagine how much Caemon would have enjoyed this process, that he would have loved seeing his old UCSF friends and gifting them boxes and boxes of books. Instead, we pass on the gift of one of Caemon’s greatest loves and take some joy in knowing our boy would most certainly approve. 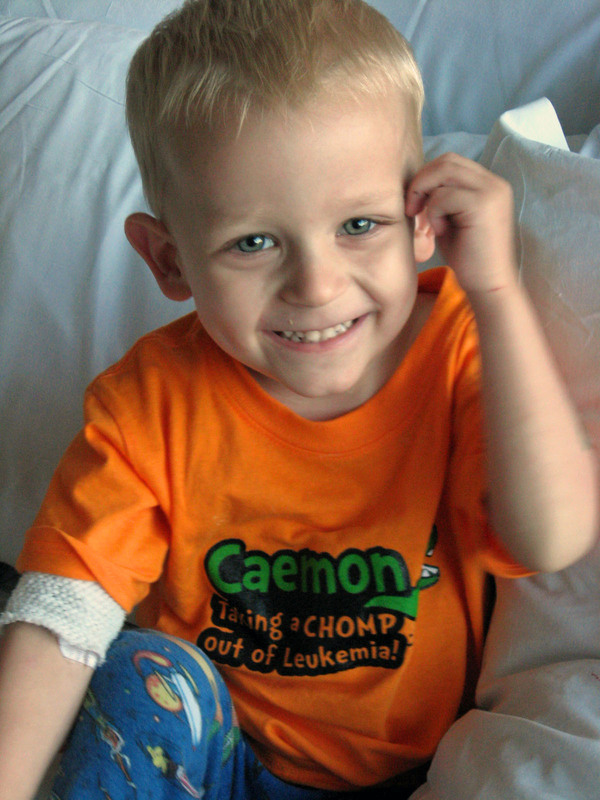 This entry was posted in Uncategorized and tagged bereaved parents, C is for Crocodile Book Drive, Caemon, Caemon's Legacy, childhood cancer, UCSF on March 20, 2015 by T.